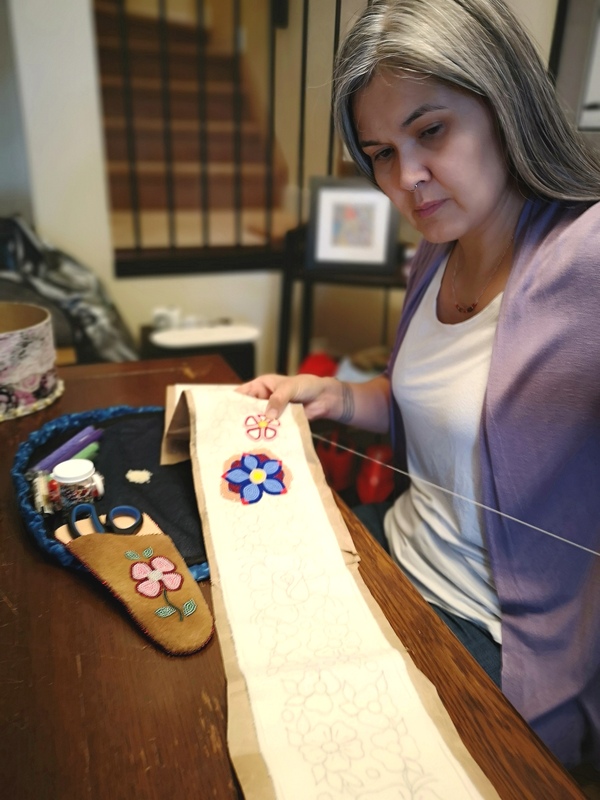 This summer, the Athabascan Woman Blog is featuring an Athabascan in the Spotlight. Elaine Alexie is Teetł’it Gwich’in from Alberta, Canada. 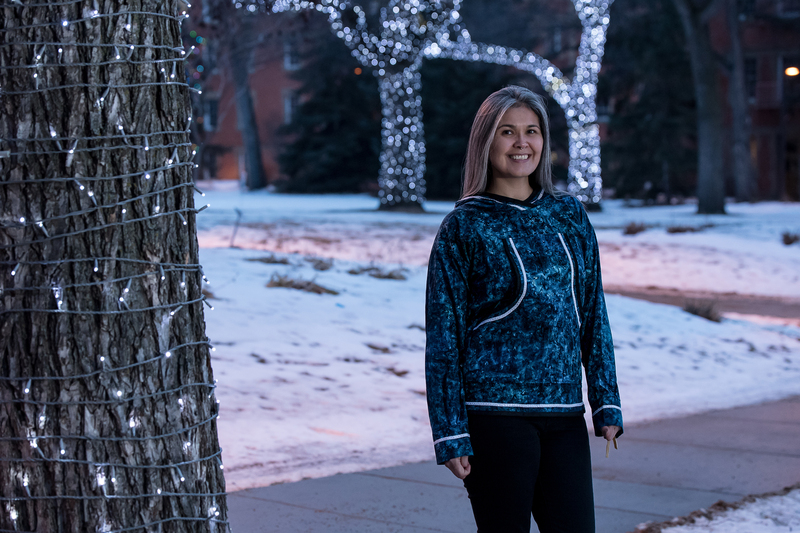 I have been following her for a few years, and am excited to feature her on the Athabascan Woman Blog. She and I share a love of beading. We both learned our sewing and beading skills from our mothers. Her mother is her biggest supporter and continues to be an inspiration. My name is Elaine Alexie and I am Teetł’it (Tee-tlit) Gwich’in. I currently reside on Treaty 6 and Metis homelands in Alberta, Canada with my loving partner Adam. My home community is Teetł’it Zheh or Fort McPherson, Northwest Territories (NWT), Canada. Teetł’it Gwich’in is loosely translated as, ‘the people of the headwaters’ or ‘above the water’ people. Our ancestral territory extends from what is now described as the Peel River Watershed in the central area of the Yukon Territory to the Mackenzie Delta region of the Northwest Territories in Northern Canada. I was born in the NWT and raised in Teetł’it Zheh within my large and extended Teetl’it Gwich’in maternal families of both Vittrekwa (Don’t Cry/Esau) and Alexie (Martin/Sha un Nakhya). Like many other families, I have many aunties, uncles and cousins all around. I come from a large family of creators and makers. In some ways, I like to consider myself more of a Yukoner as I spent a majority of my childhood out on the land with my family at our winter/spring camp at Tr’atr’aataii Njik, which is approximately 80 miles upstream on Teetł’it Gwinjik, the Peel River, on the Yukon side. I left home in my mid-teens to go to high school in other regions of the NWT. At the time, this was the only option. After school I had the opportunity to work on the protection of the calving grounds of the Porcupine Caribou Herd in the Arctic National Wildlife Refuge. I spent lots of time touring with other Gwich’in to the Lower 48 and lobbying the US Congress to protect the calving grounds. I also worked in other areas of land protection and Indigenous rights in Canada, including the protection of the Peel Watershed and Dene resistance to the revived Mackenzie Pipeline proposal. These experiences taught me a lot about community organizing and communication. I have always had a fondness and love for traveling in my peoples lands and I did it a lot growing up at my family’s seasonal camps. Later on, I rafted and canoed rivers during the summer seasons. A big part my who I am is connected to water. This interest led me to get my certifications and training for being a raft tour guide. I worked in film and TV production as a producer for several years but was laid off during the recession in 2008. Fortunately, that same summer I was accepted to the University of Victoria in British Columbia and my river rafting dreams slowly would diminish from there. To get my degree done faster, I did summer school sessions, so I wasn’t able to continue my love for being on the water or to work in that area. My university experience became another door that opened many other doors, and I trained in the area of political science/Indigenous studies. I enjoyed it so much I continued on for my master’s degree in Political Science. My degree was thesis-based, so I worked with my elders and led a community-based research project on my people’s use of traditional governance. This project grounded land-based practices and explores how it informs our indigeneity that is essential to our self-determination. I find research amazing and I really enjoy it, when done right and respectfully. I enjoy working with community knowledge holders and building projects with them. 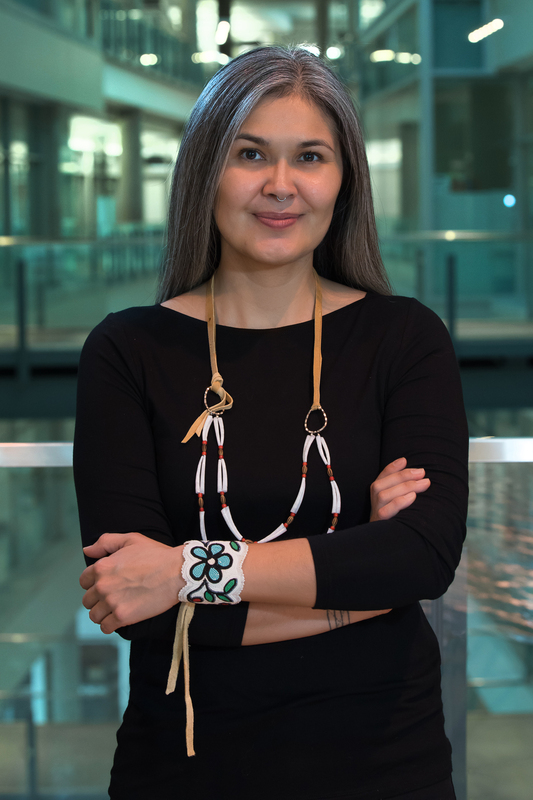 I currently work at the University of Alberta in the Faculty of Native Studies in northern research engagement and part of my job is to build research partnerships and relationships with communities across Northern Canada. Can you tell me about any recent projects you’re working on or maybe one you finished? 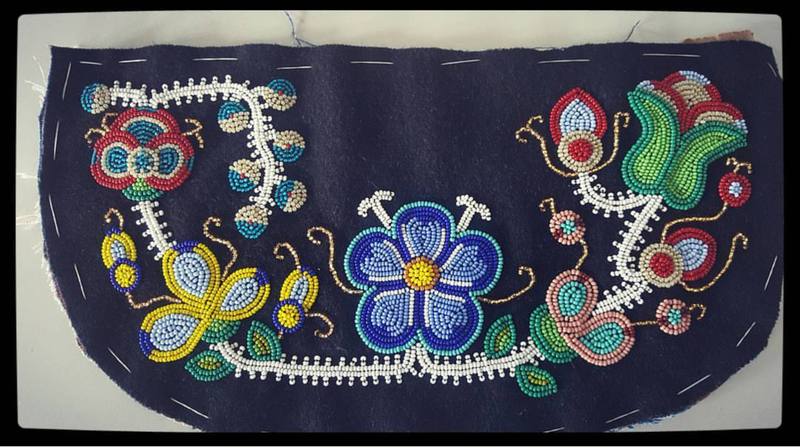 I have one major project on the go right now: a Gwich’in style beaded baby belt. I am using mostly seed beads on stroud and velvet. I have acquired some vintage pony beads to incorporate for the tassels, so I am excited about that. I have been researching old styles of Gwich’in baby belts by visiting museum collections and looking at resources online. This past winter, I visited the Royal Alberta Museum, Bata Shoe Museum and Royal Ontario Museum to see Gwich’in pieces in their collections. I’ve seen a very old baby belt dated to at least late 19th century and a Hudson’s Bay flour sac was used as a liner. Old! This demonstrates that certain materials were not within reach and people used everything they could to make things with whatever they had available. That’s pretty special. I really admire the old-style beading and the use of velvet. I appreciate the use of certain bead colours no longer in production and the formation and use of floral motifs. It is also not very easy to bead on velvet, so it takes some skill. Each beaded flower motif tells a story and that is something special to pay attention to. This reflects our peoples surroundings or in some way, interpretations of the beauty of our cultural landscape, as our ancestors have seen it. 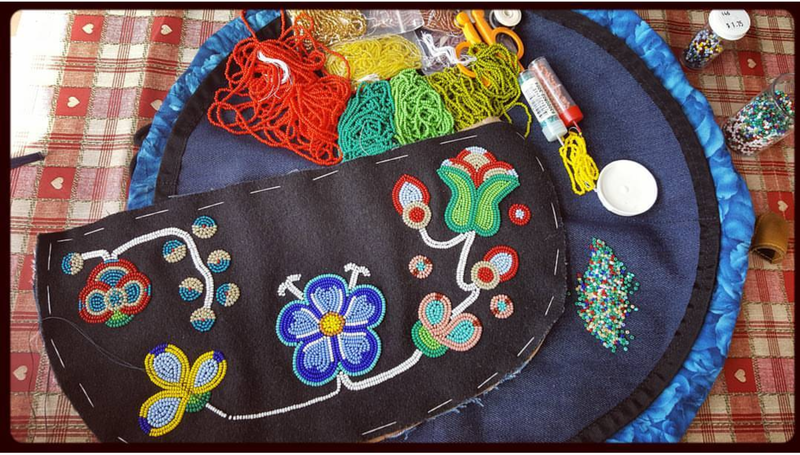 I am fascinated by all this and want to continue the art of my peoples beadwork and continue the use of the old style in a variety of ways. One project that relates to this topic is a bag I completed with the help of my sister, Shirley, and mom, Dorothy. I sewed it together in a two week period, alongside tanning caribou and moose hides with my mom, and it was deeply gratifying. As exhausted as I was physically at the end of our days working on hides, I managed to sew and bead in the evenings. Surprisingly, I found doing these different tasks went hand in hand. What influenced my desire to do this bag was an old school bag my mom owns that is about 70 years old. 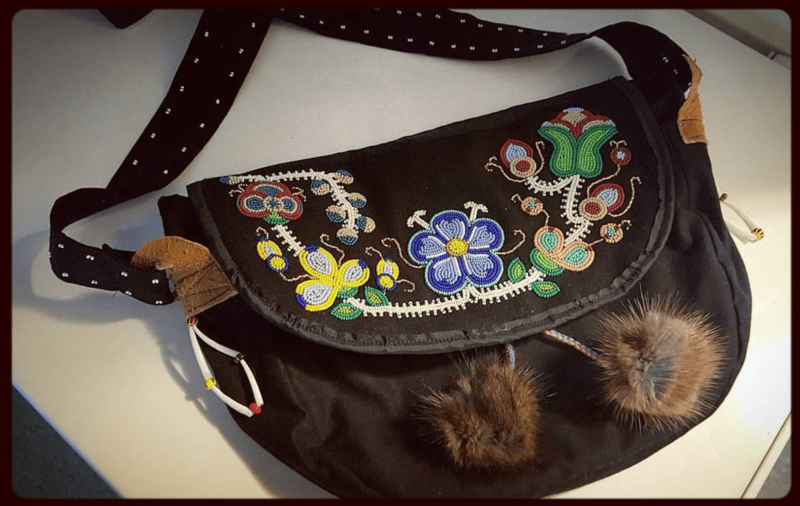 This bag was fully beaded in the traditional way – on blue velvet and old Gwich’in beading floral motif pattern. It is simply beautiful, and I’ve admired it all my life. The bag was considered my mom’s bible bag to store her bible and hymn books, and she would occasionally take it with her on her weekly visit to church. For the bag I worked on, I freestyled the beading based on learning about certain floral patterns and cut out a pattern to bring it together. My sister is a master at the sewing machine, so she showed me the best way to sew it together. Our mom watched and instructed us on certain things to pay attention to. It was a great thing to do with several family members. I am super proud of it because it was made from scratch and drawn from a vision I had. That is, a vision that was inspiration based on Gwich’in items that I’ve researched through books and viewed in person. Do you have any web or social media links you would like me to share? 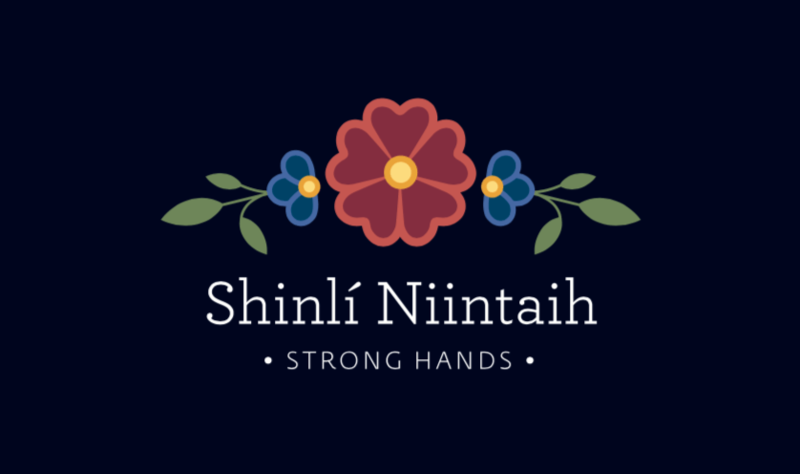 Elaine Alexie’s new business and collective is called, Shinli’ Niintaih, which means my strong hands. 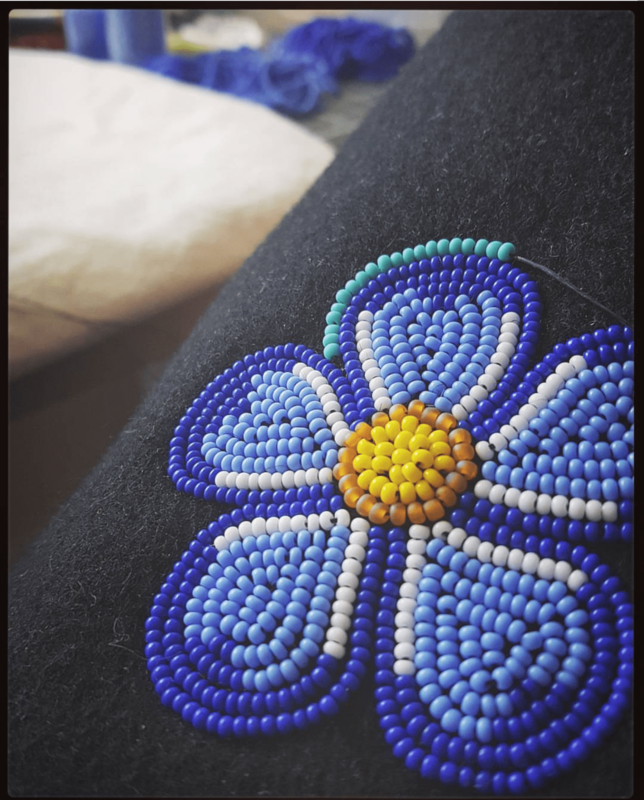 Over the years and to offset my loneliness for my land, home, family and culture, I took up beading and making things to keep myself busy. This has been on and off over the years, but I really picked it up in university. I continue to work on projects while working full time and have started a small business on the side, Shinli’ Niintaih: my strong hands, a name that my mom and I came up with. I gravitate to this concept because of my life-long love of learning new skills. I love that. My work and many other things that I am invested in begins with the understanding around the concept of Shinli’ Niintaih. I have started a Facebook and Instagram page for Shinli’ Niintaih, so people can follow my research and journey in making things with my hands. You can follow @ShinliNiintaih. From time to time, I will sell items I make, so if people want to purchase they can. An incentive that really got me to begin Shinli’ Niintaih was what started as making gifts to family and friends over the years became larger as more people came to me for custom pieces. A portion of my jewelry making sales will go toward youth cultural resurgence projects in my home community. My website is www.shinliniintaih.com. Shinli’ Niintaih is also a community collective. To support other Teetł’it Gwich’in artists, I help them by selling their work online. All of the proceeds from their sales goes to them. I believe strongly creating opportunities for people to generate and keep the art forms alive is incredibly vital for knowledge transmission, and the relationships that result, in Indigenous communities. A key component of material culture creation is not just in the tangible process but the making of kinship along the way. My philosophy and approach to social media is that I am always happy to share knowledge with other Indigenous community members and youth. I love to connect with other artists in an open, uplifting and supportive way, and to share my love for making things. About five years ago, Ned Blackhawk gifted me the famous book, ‘Northern Athapaskan Art’ by Kate C. Duncan. I was floored, because the book is now out of print and I felt I hit the jackpot. I have always had an interest in making things and having cultural influences all around me growing up was something I was always used to. This book help to start my interests in looking at my peoples art forms more closely and I have been able to start my journey in researching the many forms of Athapaskan material culture and artistic practice. I have so much gratitude to the researchers who have recorded the oral knowledge of the elders in the communities on the knowledge they carry. There is so much more work to do. I hope to do my PhD in the next few years on this very topic within my peoples practices to help preserve knowledge and the practice of Teetł’it Gwich’in art forms. Enaa baasee’ to Elaine Alexie for sharing on the Athabascan Woman Blog! It was great to learn a little bit about her background, process and inspiration for her work. I know it takes a lot of time, trial and error and dedication to learn about beading. I love seeing her style and uses of colors and materials. Do you have someone you admire, like a culture bearer, artist, storytellers, activist, role model, community doer, language warrior, leader, hunter, gatherer, parent, or grandparents? Find out more about how to submit a nomination here: http://athabascanwoman.com/?p=4248.